Elements Collection - "Bless You Ornament"
Home > Sentimental & Inspirational Gifts & Everyday Home Decor > Elements Collection - "Bless You Ornament"
Sentiment - May the Lord bless you. 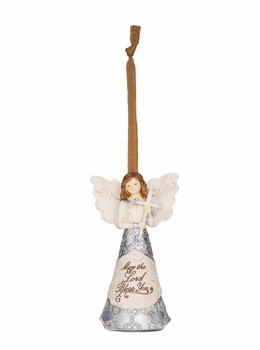 Elements are a beautiful and unique line of angels and figurines featuring signature birchwood accents with intricate pewter detailings. Each is branded with inspiration and sentiment ...perfect for gifts as well as your home. Size 4.5" - Beautifully packaged in a wood grain finished gift box with a rich metallic embossed pewter sleeve.